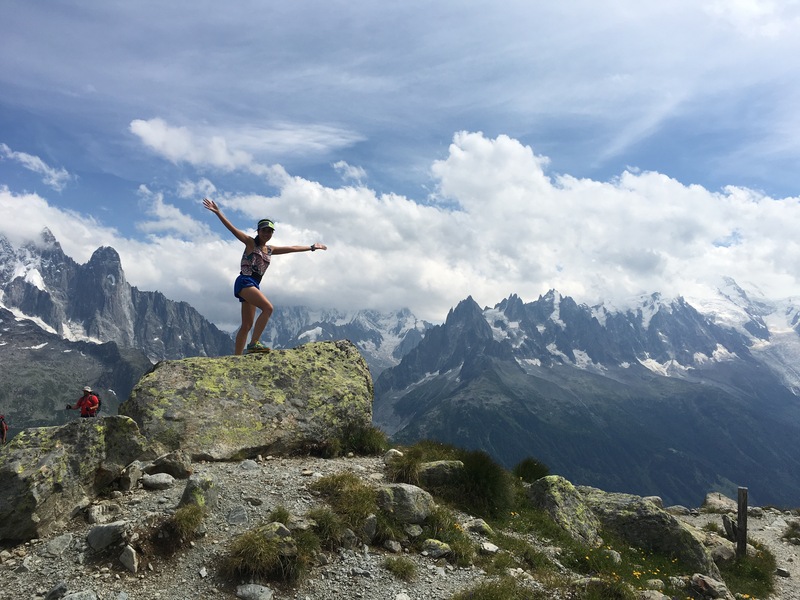 It was our third day in Chamonix before we did any real running, and it was more of a hike/jog if we’re being honest! But that’s fine, what we really wanted to get out of this week was some long slow base building miles that would helpfully heal all our injuries and niggles and get us ready for the start of marathon training! That’s right – our second marathon (Abingdon) is looming just a few months away. 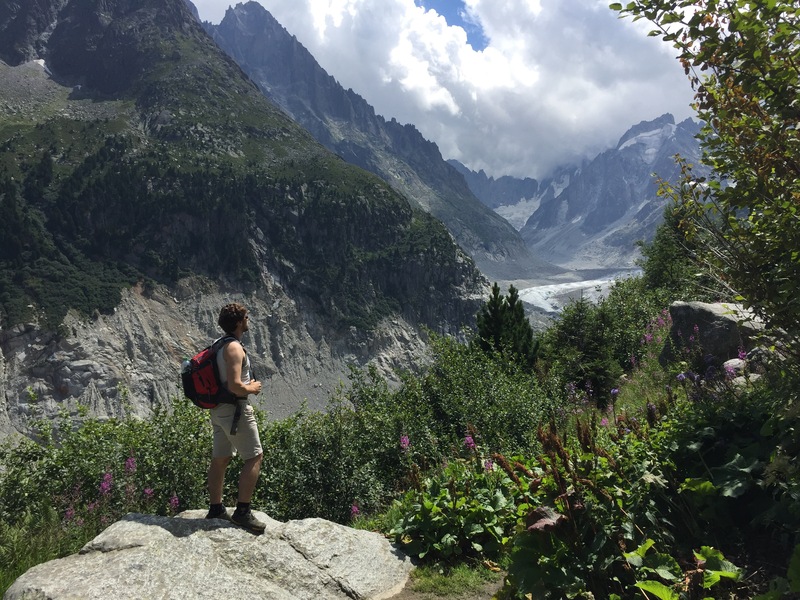 Chamonix is an amazing place – it’s a valley on the north east side of the highest mountain in the Alps and the European Union – Mont Blanc, on the border between France and Italy. The closest airport is Geneva (Switzerland) and the alpine scenery is simply stunning. Glaciers snake round the peaks towards the valley. Charmonix itself is a lovely little alpine village, perfect for ski holidays, filled with patisseries, sport equipment shops and cozy outdoor cafes. 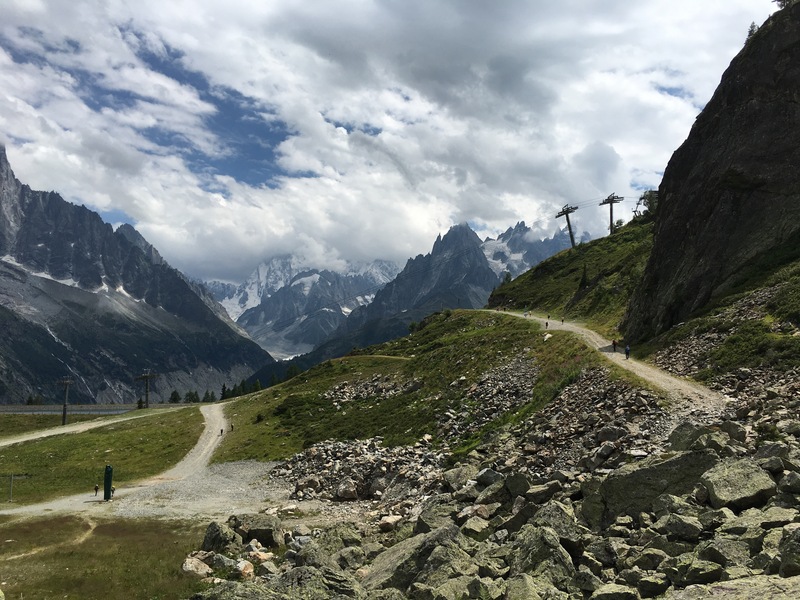 This morning, we took two cable cars to the Aiguille du Midi which is 3,842m above sea level. It’s the highest point accessible via ski lifts and provided some truly amazing views. I was absolutely taken aback. It truly felt like I was standing on top of the world, mountains spreading as far as the eye can see and no sound to disturb the peaceful silence. 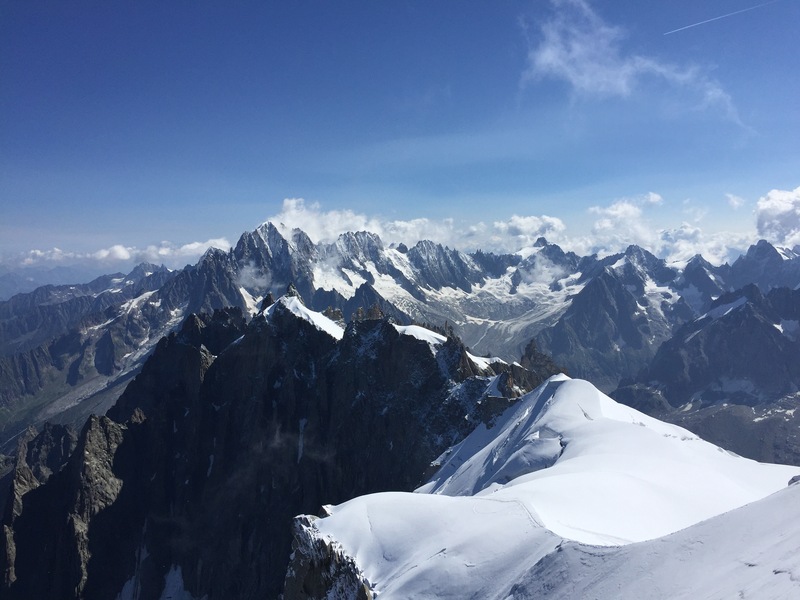 I wish I’d brought trousers as we had to wait for about half an hour in the freezing cold at 3,842m to ‘step into the void’ – essentially a glass box built on the side of Aiguille du Midi’s viewing platforms. The box, comprised of three glass walls, floor and ceiling panels, allows visitors to stand above the 1035m drop to the peak beneath their feet and admire the views from a dramatic perspective. Back on the valley floor we took the bus to Les Praz and the cable car to La Felegere, which was the start point of our hike. 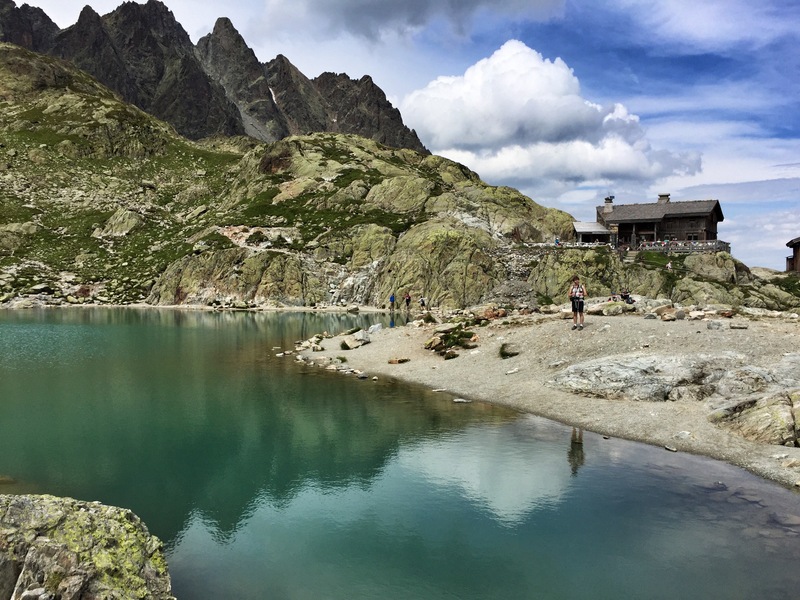 The first section of the trail was signposted to Lac Blanc to the right, straight after exiting the cable car station. It led deceptively downhill for a few hundred meters. I say deceptively because after that first decline there was nothing else but up! 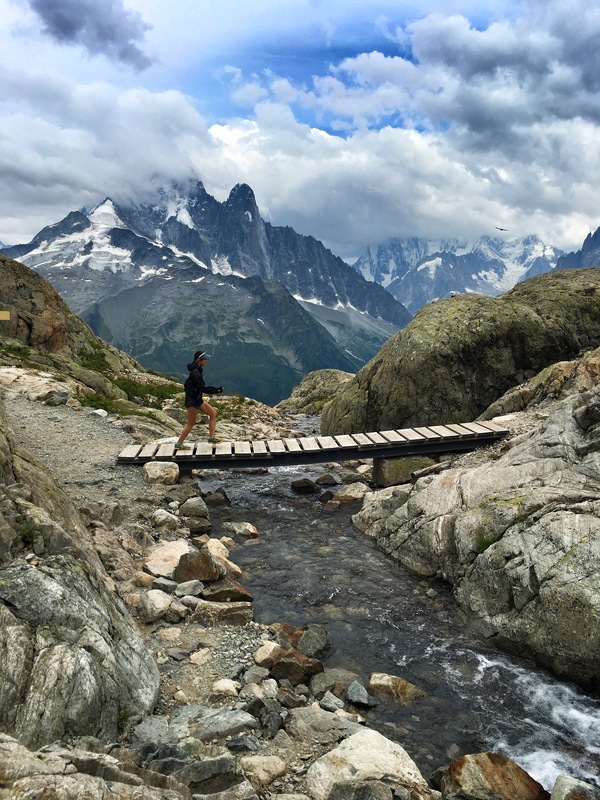 We started off with an easy jog along the trail, which winds its way around the flank of Aig le Du Belvedere through small plateaus and large rock fields. After about 10 minutes we started scrambling past hikers going in both directions. This didn’t distract us from the view – to put it simply, the views were breathtaking. 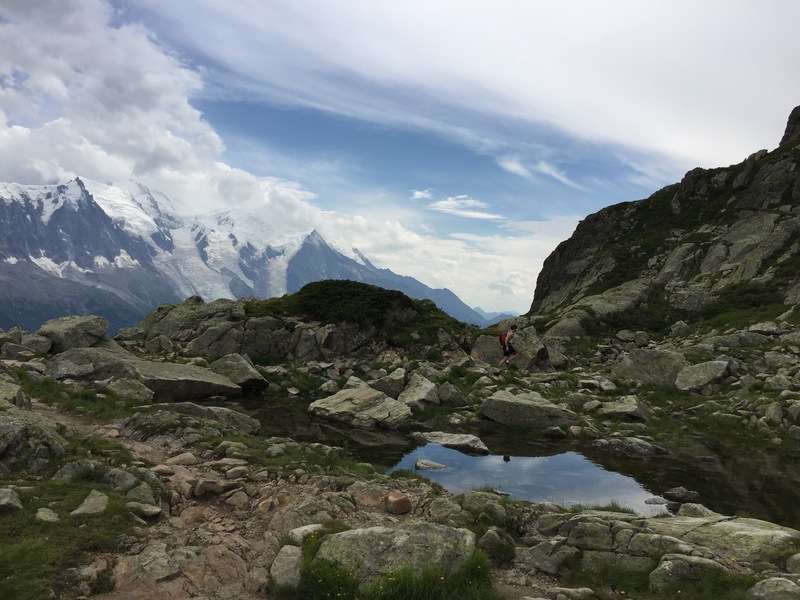 We were jogging/walking on the opposite side of the valley to Mont Blanc, meaning that we had amazing views back towards the Mont Blanc massif and we had great views of the multiple peaks and the icy glaciers the whole way up to Lac Blanc. The trail was easy to follow, but hard and rocky almost exclusively. Finally, we made it to the lake, out of breath but exhilarated we had made it up in 45 minutes (given that we were told that we should leave two and a half hours for the hike up!) 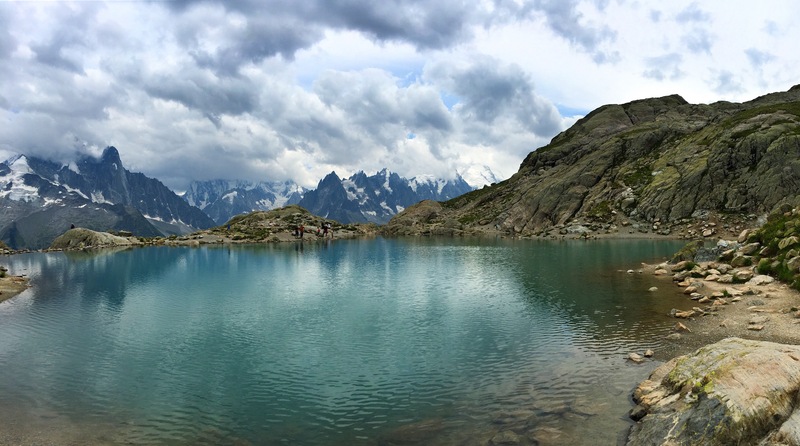 The lake was a clear turquoise blue, surrounded by the mountains I can’t stop mentioning. It was stunning! 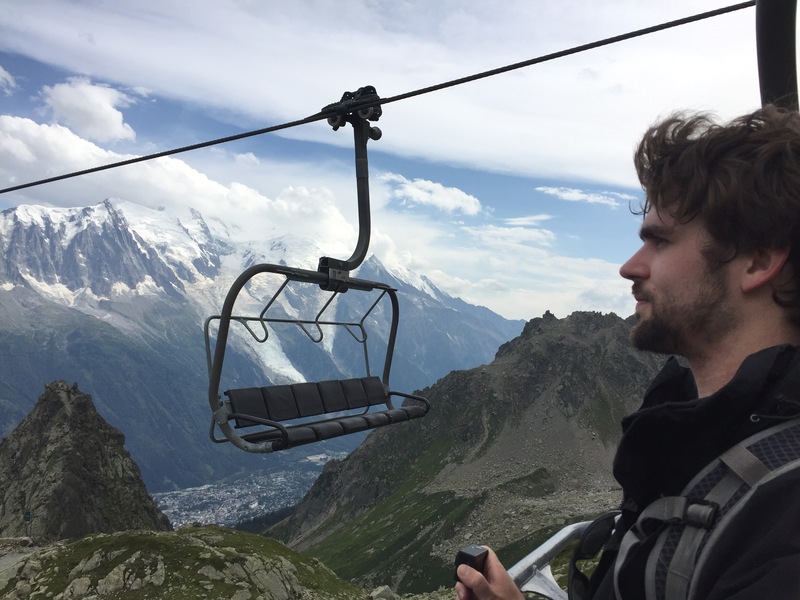 We now had two choices, to return the way we came or to attempt more elevation to a higher ski lift – that would allow us a hasty descent. At this point it was becoming grey, and although it was only early evening, we were genuinely concerned that we may get lost and would be stuck in a thunder storm – a daily occurrence in the last few days. We retraced our steps for about 200m before we spotted signposts. One pointed down to La Flegere and the other pointed across and up to L’index. We decided to pick up the new route to the higher point L’index. This trail had more elevation, as well as via farata style cables and steps for short periods. Overall, it was more runnable, but the path was not quite as clear until we noticed the yellow spots on the rocks that marked the way over several scree patches. 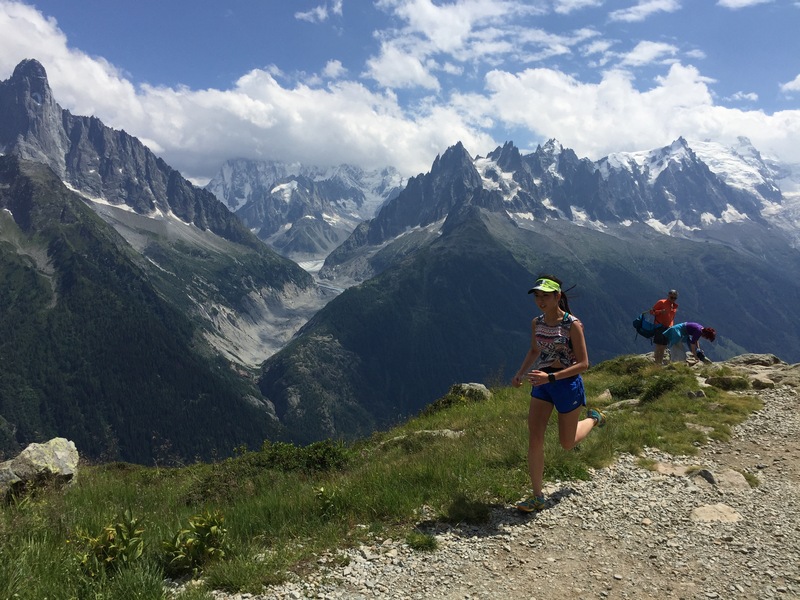 You guessed it – this part of the run also had beautiful views! At the cable car, we were surprised to find that it was actually a chair lift, the kind where skiers could dangle their skis while being hoisted to the start of their slopes. 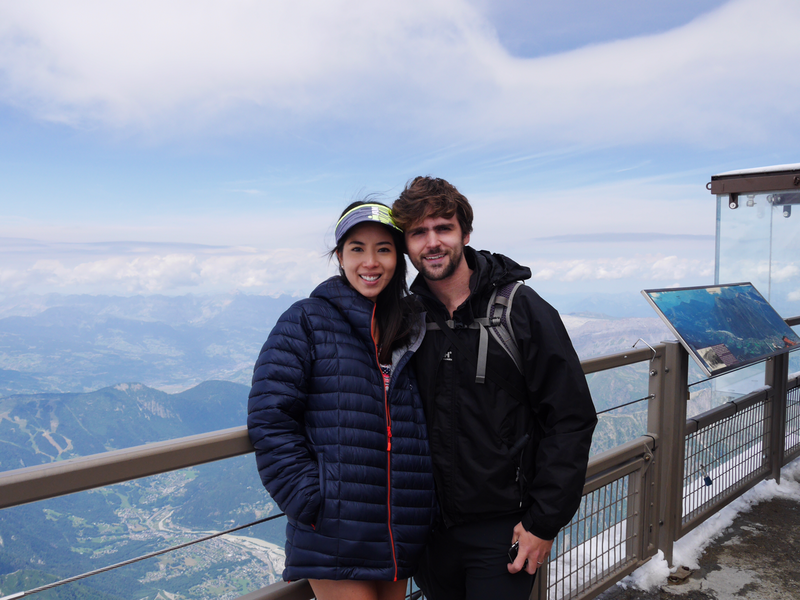 We were a little hesitant at first, but taking the ski lifts definitely seemed a better alternative than the long walk down – so we had little choice in this matter! This was a nice hike that anyone could do with a good level of fitness. The trails were well marked and well maintained. The rocks gave good grip and there were no steep drops – would highly recommend this to anyone who’s in Charmonix!